A group of dog lovers put together a Barktoberfest at Point Isabel every year right around Halloween. 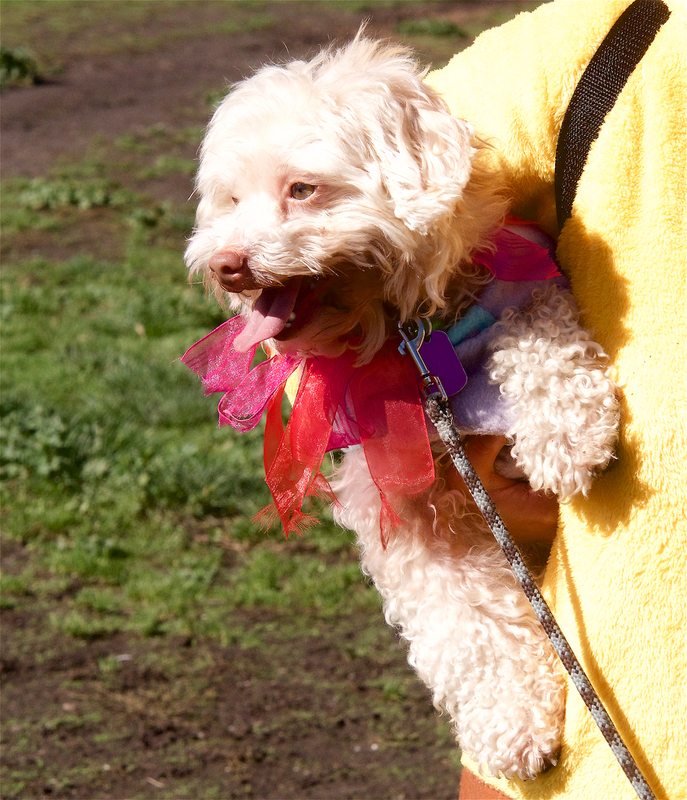 The even includes a parade and costume contest for dogs. For the past several years, I always missed it for one reason or another. This year I wasn't sure if I could make it either until the last minute. It had been raining which is unusual for California, where I can't remember when was the last time we weren't having a drought. 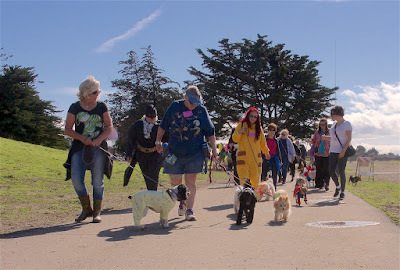 This year's Barktoberfest was scheduled on Saturday, October 29th. It was still raining that morning. Around 10 a.m. the sun came out and the rain stopped. Around 11 a.m. the sun disappeared and it started drizzling again. I made a circus clown costume for Cracus a few weeks ago. He's been running around in Point Isabel in his costume. People smile at the sight of his craziness. At 12:30 p.m., it became obvious that the sun was going to stay around. I quickly put on my Pikachu onesie and put Cracus in costume. I forgot the hula hoop I was going to bring with us as we rushed out the door. We got a big bag of treats just for registering our names for the contest. We were number 9. After everyone had a chance to register, we paraded down the trail. Since I forgot to bring the hoop, all I could do was making Cracus walk on his hind legs and twirl around as we paraded. People were already amused by his "tricks." The judges were making notes and giving scores while we showed off our pups. After a short parade, we turned back to the area where we first gathered and waited for the announcement of winners. It was nice that they divided the dogs into three groups by size. Cracus is a small dog. They announced the first runner up in small dog category. 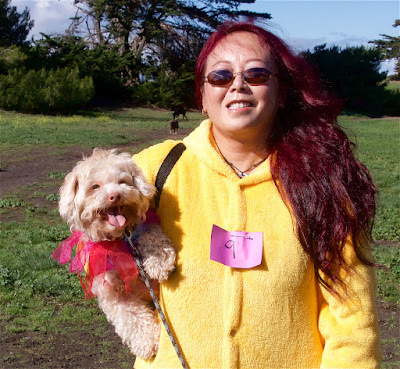 It was a pup who had a giraffe costume on. When they called for number 9 as the second runner up, I couldn't believe it. There were so many nice costumes. Maybe it was the twirling. We went up to the front, and someone from the audience asked to have Cracus "dance for everyone, so he happily did a few more times. We received an award certificate with a big bag of prizes and had our photos taken. We couldn't stop smiling!